The Closer to Nature Single Electric Breast Pump is portable and lightweight and is designed for faster, easier, comfortable expressing. The pump can be electric or battery operated perfect for home, work or travel. The soft silicone cup is specially designed to mimic a baby's natural feeding action. Combined with the new valve, the pump provides a gentle and efficient way to express breast milk, whilst offering maximum comfort for mum. A new, one piece valve provides improved suction, improved efficiency and guarantees 0% backflow. With 4 settings to choose from, Mum can control let down and flow, to maximise her pumping experience. 0% backflow guaranteed. The breast pump comes complete with its own microwave steriliser box for easy & quick sterilisation. The soft silicone teat feels like skin, and gently elongates and flexes during feeding to mimic natural breastfeeding action. The breast like larger shaped teat of the Closer to Nature bottle allows baby to latch on easily and further supports the transition between bottle and breast. Closer to Nature breast pumps make it reassuringly easy to give baby the benefits of breast milk when feeding time requires a bottle. Discreet and comfortable to use, our Closer to Nature Single electric breast pump system makes it easy to give your baby all the benefits of your breast milk, even when you're not there. Expressing is a great way to help your baby get all the goodness of breast milk even when you're not there. Tommee Tippee, from the UK based Mayborn Group Limited, is the number one baby feeding accessories brand in the UK and one of the top brands of infant products and accessories in the global market. Today, Tommee Tippee innovations provide comfort for babies and peace of mind for parents in 45 countries around the world. Bottle complies with EN 14350. Electric Breast Pump: PP, Silicone and ABS. Breast Pads: Paper Pulp, PE film and SAP. Steriliser Box: PP and TPE. Registration No. RCD001185342-0001, -0002, -0003, -0004. 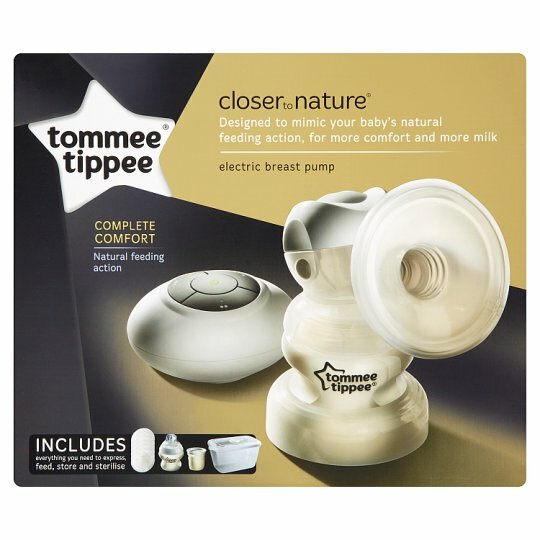 Breast pump only suitable for use with Tommee Tippee closer to nature bottles. Tommee Tippee Closer to Nature bottles are only suitable for use with Tommee Tippee Closer to Nature teats. Please retain our address for future reference.